When creating any still life composition, my favorite part is pulling togetherÂ seemingly unrelated objects and letting the story evolve on its own. I feel I have been mostÂ successful when the end result leaves open numerous possibilities for interpretation for me as much as for any viewer who may stop for a moment to take in the scene.Â In S.E. Hinton’s novel, The Outsiders, she brought together a colorful cast of characters to illuminate a striking and beautiful coming of age story.Â In the context of the Convention Center expansion, I like to think of this piece as bringing a spotlight of celebration onto all who come together to make Columbus a star. 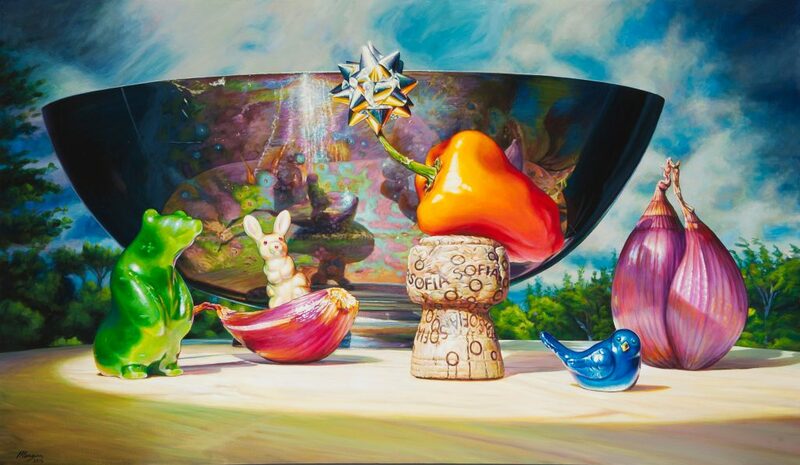 Having been recognized as an established and accomplished portrait artist for the past decade, Morgan currently finds his artistic direction moving toward contemporary still life painting rendered in a hyper-realistic style. Judiciously choosing his still life objects, he cleverly juxtaposes unusual items such as produce, worn toys and vintage glass objects to produce thought-provoking compositions.Â In creating his works, he draws upon the techniques of Old Master painters such as Rembrandt and Rubens by employing chiaroscuro, or the contrast of light and dark areas in a painting. His primary focus as a fine artist has been on the contemporary still life, portraiture, and large-scale mural work; including outdoor murals in Wilmington, Yellow Springs and Springfield, Ohio. 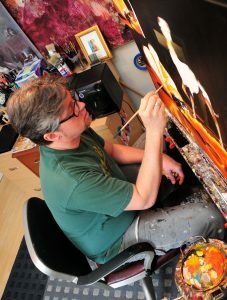 He is largely self-taught and draws inspiration from Rembrandt, Norman Rockwell, John Singer Sargent, Maxfield Parish, and N.C. Wyeth.Â It is his keen sense of observation that allows Morgan to easily transition from portrait work to contemporary still life painting.